Free Kindle short story one day only – Saturday, August 10 | Victor D. López, J.D., Esq. 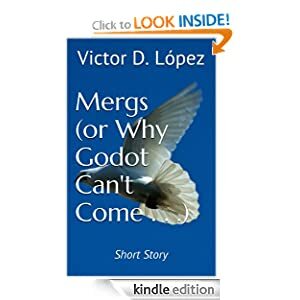 Mergs (Or Why Godot Can’t Come) free for the Kindle for one day only, Saturday August 10. In a world that worships power and raises human beings onto pedestals erected from the insubstantial building blocks of ego, hubris, and self-delusion, it is no wonder that we look for meaning and enlightenment in all the wrong places. We turn a dismissive eye to human suffering and most other things that might blur the image of our own reflection in the world around us. We walk by a homeless person while looking away at more inviting vistas, or perhaps assuage our guilt by putting a dollar in their empty cup with the knowledge that there for the Grace . . . . But what if we could see that each one of us–even the most wretched soul amongst us living in despair without hope of redemption–is, in fact a god in a universe of one whom sentient beings worship and depended totally upon for their own salvation? At present, Amazon prime members can also borrow three of my books and a number of other short stories for the Kindle. You can see the list and view the links for these by clicking on my photo below. Thank you for your interest and support!